The vibrant creative shoot presents a modern trend for the unconventional through the celebration of paper art and design. 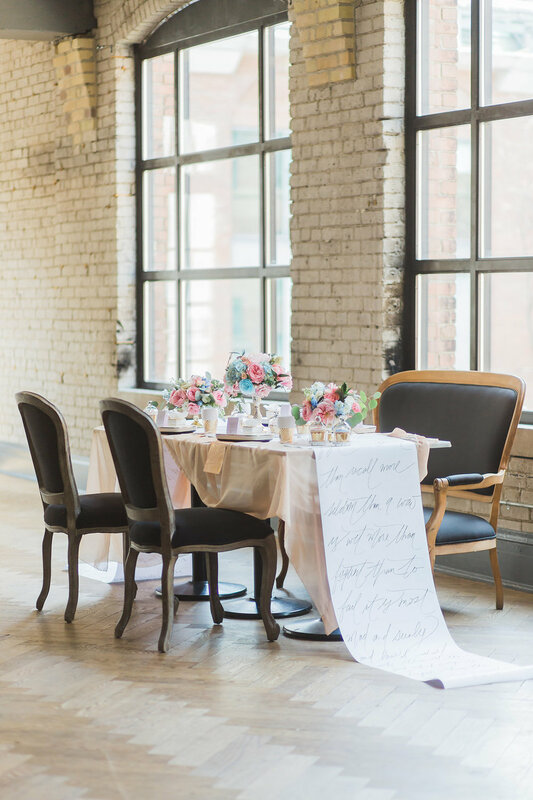 With the Storys Building in Toronto as an elegant urban landscape, the project ventures the use of craft paper artistry that pushes the envelope of wedding design in the colour palette of rose quartz and serenity blue. 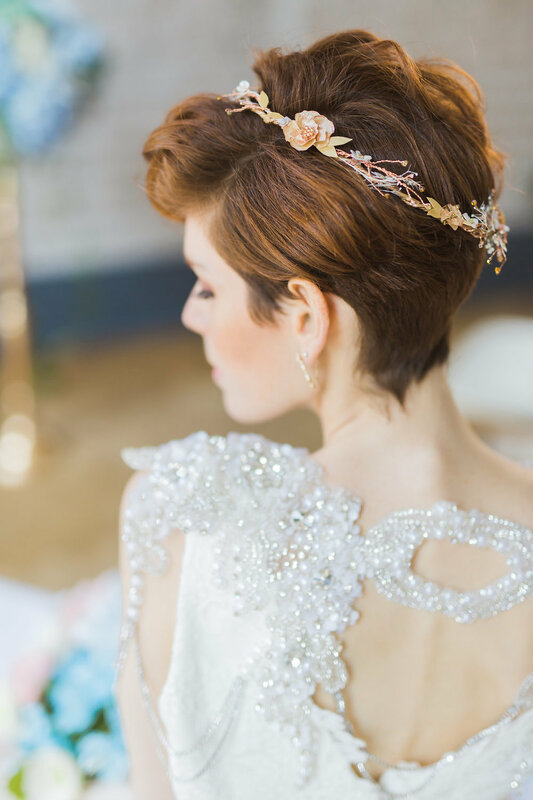 Donning a luxurious floral kimono by Weddingstar, the bride is styled in a sophisticated, whimsical linen dress paired with an intricate jewelry bolero by Sash and Bustle. A laced paper flower and crystal headpiece crafted by Bunny Bum Boxes crowns the bride with a most delicate bridal feature. The style is completed with a beautifully modern and classic look perfected by hair and makeup stylist, Covet Co. The day was graced with sunlight streaming through the large historic paneled windows. A tasteful suit by Wingmen was embellished with a crêpe paper boutonniere that perfectly coupled the playful pair. 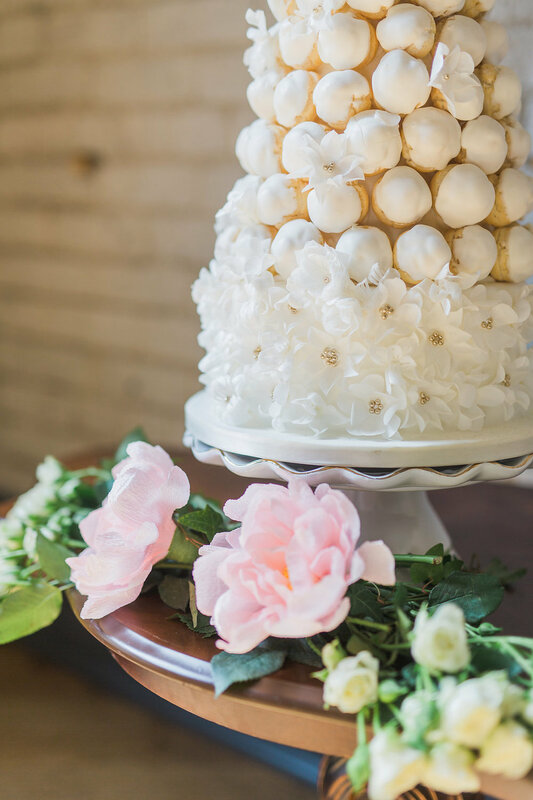 Both boutonnieres and matching crêpe paper bouquet showcased a sophisticated ensemble of craft work that details each bloom and petal that flows in its organic texture yet steadfast form. The combination of the form and texture of the crêpe paper floral work appreciates the conceptual presentation of paper that celebrates its tradition as a material and the contemporary function of use. 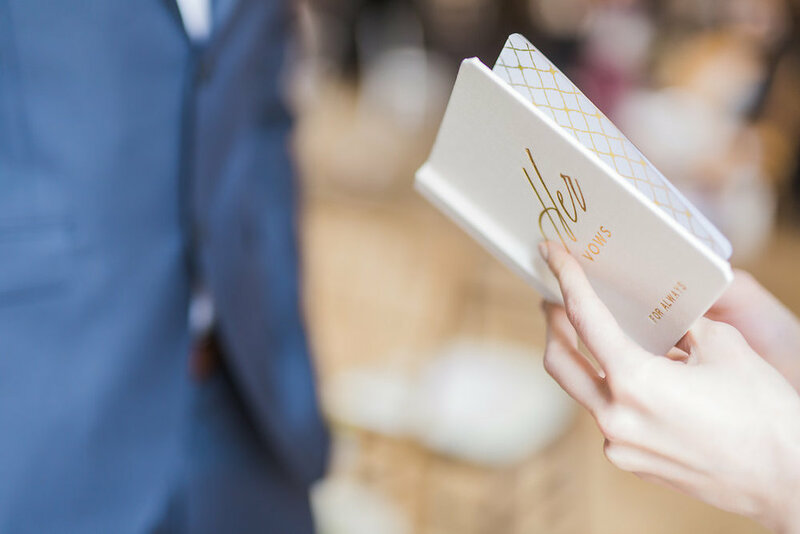 All crêpe paper seen in this project was sourced by Carte Fini. The reception space is introduced by a duo of artful vignettes with paper sculptures by Christine Kim, as well as Lumiere Luxe. An array of sculptural pieces with hand cut patterns on each facade embraces the floor of the building balcony that overlooks the cityscape. A beautiful vertical paper floral installation adorns the rustic brick wall of the Storys building. 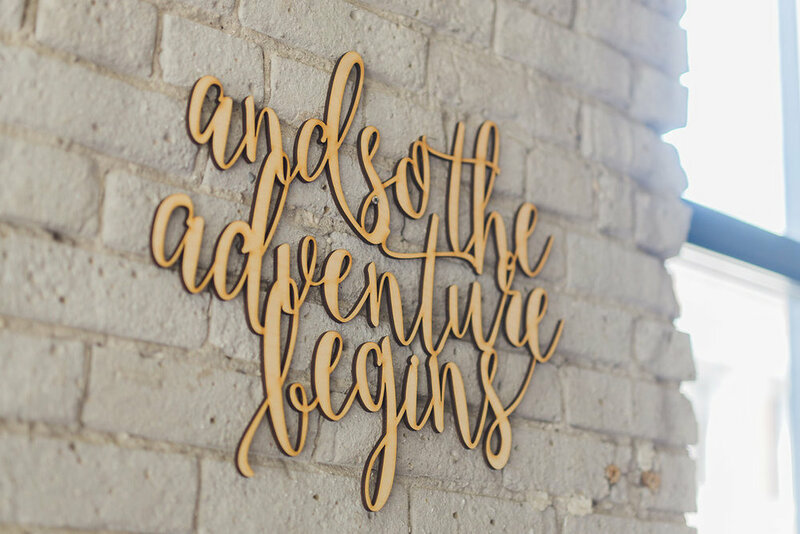 Introducing the tablescape is a custom made wooden sign by Pulp Function that tastefully commences the soirée. 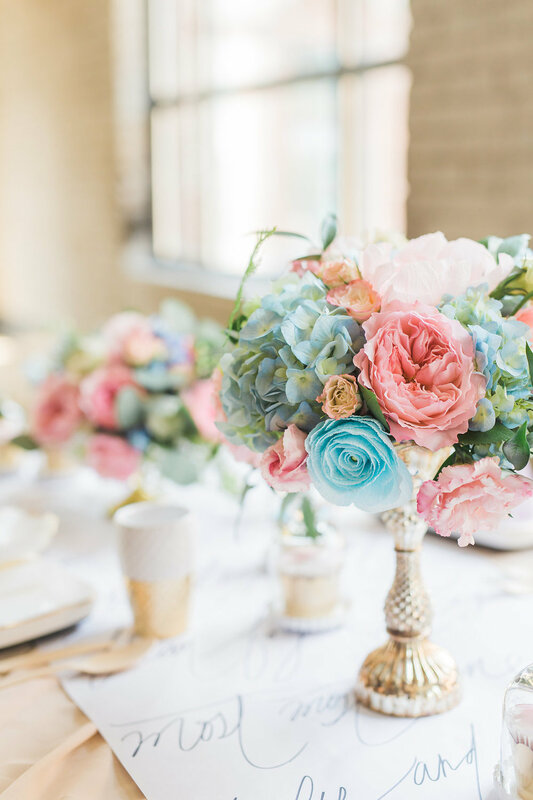 The tabletop setting is bright and playful and filled with brilliant florals in pink and blue. 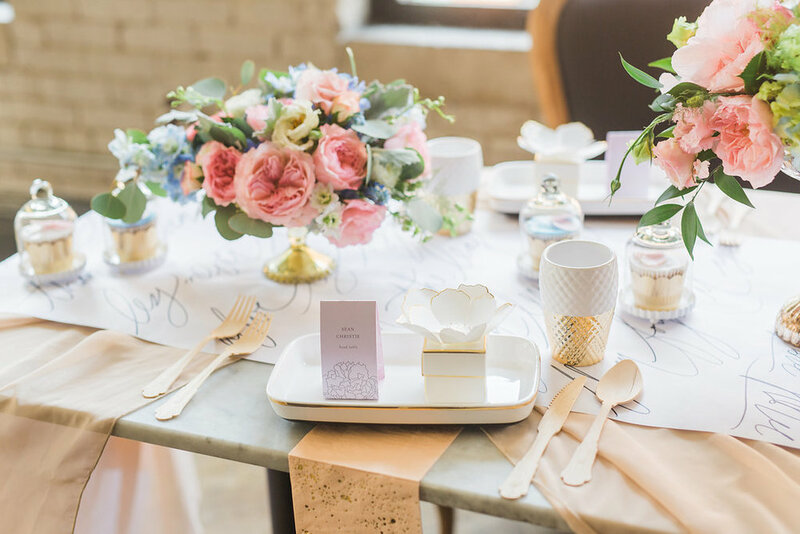 A collection of cupcakes and sweets with wafer floral petals and posies by Jacq Baked Goods cheerfully positioned in mini glass domes and atop a paper calligraphy table runner. 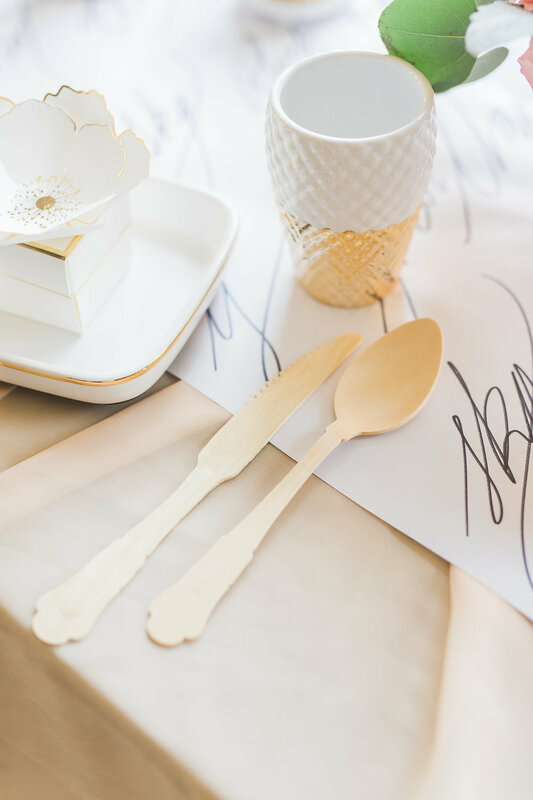 The lively mix of crêpe paper and fresh blooms accompanies the elegant ensemble of paper and pulp tableware provided by Bonjour Fête. 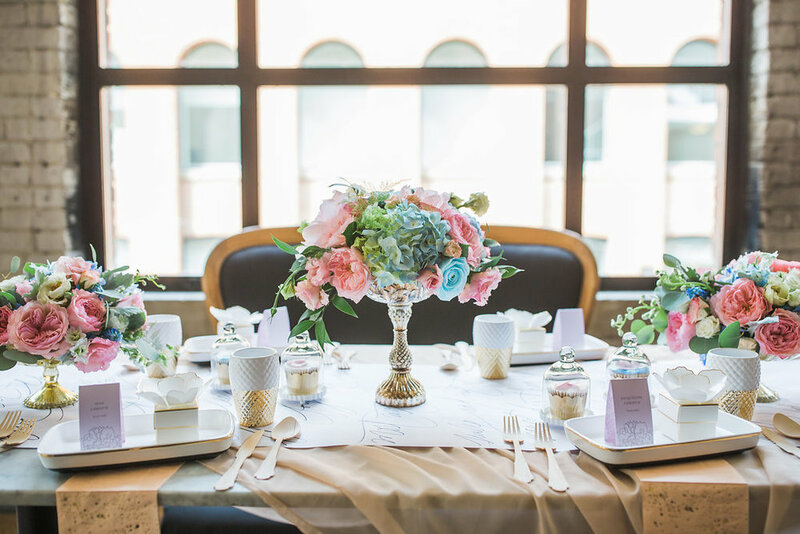 The couple donning glittery and bright attire plays with the fanciful setting that introduces the culinary affair alongside the delicate patisserie creations by Patricia Cake Creations. 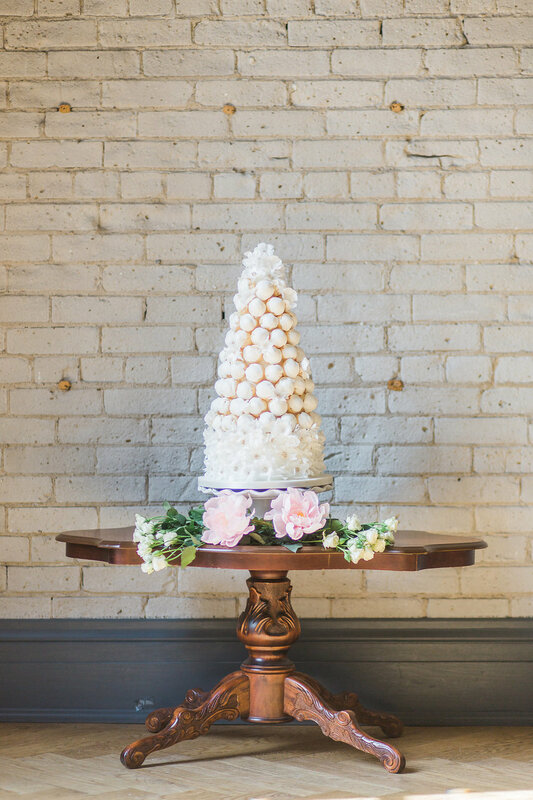 A fantastic croquembouche tower adorned by wafer paper posies and pearls completes the celebration on a delicate sweet note.